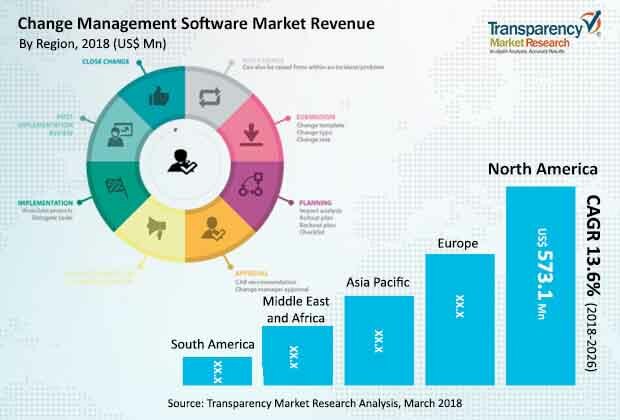 Transparency Market Research (TMR) has recently published a new report titled “Change Management Software Market – Global Industry Analysis, Size, Share, Growth, Trends, and Forecast, 2018–2026”. According to this report, the global change management software market was valued at US$ 1,063.8 Mn in 2017 and is anticipated to expand at a CAGR of 13.6% from 2018 to 2026. North America is expected to continue to dominate the market during the forecast period. The market in the region is projected to expand at a CAGR above 12% between 2018 and 2026. A shift from traditional systems to cloud-first approach among enterprise application buyers, stringent government regulations, and rise in connected devices are expected to propel the change management software market. Presently, various enterprises are digitizing critical tasks across its value chain. As IT continues, old technology needs to be replaced or existing solutions need improvements to address challenging applications. Additionally, if not planned properly, digitization makes it difficult to manage changes within the enterprise. Stakes involved with the changes to key business systems are higher and a slight error can cause adversely affect and cause loss of resources. Therefore, organizations are using change management software solution for monitoring and troubleshooting networks. Moreover, increase in demand for automated change management solution to simplify the change complexity and chaos in hybrid enterprises. Change management software help minimize errors arising due to changing configurations, improve worker productivity, and simplify overall IT change management process. The change management software market is divided into four segments, namely deployment type, component, end-use industry, and geography. In terms of deployment mode, the cloud-based deployment model is more sought-after among users. Expansion of the cloud-based segment is due to its cost-effectiveness, flexible pricing models, and increase in demand for solutions from small and medium businesses. The cloud-based segment is expected to expand at a CAGR of above 17% during the forecast period. The services segment is anticipated to expand at the highest CAGR during the forecast period. Several end-use industry verticals, especially government and IT & telecom are utilizing change management software solutions to track and manage IT changes within the enterprise. Demand for change management solutions continues to increase as it helps process automation, maintain audit trail for compliance purposes, and collaborate and schedule planned changes. In terms of geographies, the change management software market is segmented into five regions: North America, South America, Middle East & Africa, Asia Pacific, and Europe. North America is expected to account for market share of more than 45% by 2026. Increase in adoption of change management software solutions by the government and IT & telecom industries to track IT changes within organization is anticipated to boost the change management software market in North America. The market in Asia Pacific is anticipated to expand at the highest CAGR during the forecast period. Digitization, increasing cloud penetration, and advent of Internet of Things (IoT) across the region are some major factors propelling the change management software market in Asia Pacific. India, China, and Japan are major contributors to the market in the region due to rise in digitization in these countries. The market in Europe is projected to expand at a steady pace during the forecast period. Expansion of the market in the region is attributed to prominent economies such as the U.K, Germany, and France, stringent government regulations in Europe, and adoption of change management software solutions to implement latest technologies and systems by various end-use industries. Major players operating in the global change management software market include ServiceNow Corporation, BMC Software, Inc., CA Technologies, IBM Corporation, Cherwell Software, LLC., Ivanti, Axios Systems, EasyVista Inc., Micro Focus International Plc, and Zoho Corporation. These players engage in strategic acquisitions and collaborations to increase their market share in change management software market.